So, today’s paper doll was born out of a few different things. The first was that I wanted to create a paper Miss Mannequin doll with Asian features, since I hadn’t since 2015. It also seemed past time to introduce another Ms. Mannequin paper doll skin-tone. This one is a bit redder than the skin-tone I use for the paper dolls with the orange bases (like Zola) and a bit darker then the tone I use for the paper dolls with the green bases (like Sunitha). Her name, Chunhua, is a Chinese name meaning Spring Flower and was the name of a powerful woman in the Three Kingdoms period of Chinese history. I also happened to like the name a lot. A few other little bookkeeping things, I’m in the midst of updating my tags and working on my Printable Paper Doll Index, so just be aware there maybe some updates and changes there. Also, if you like the blog think about liking it on Facebook or supporting it through Patreon. Goals for this month include getting some new stuff into the Etsy Story. And since it is the end of the second quarter of the year, putting together a blog income report for the second quarter. Stay tuned for that. Lastly, I want to thank everyone for their kind wishes last week. I’m feeling much better. While I’m still not 100% (Alabama is the WORST state for allergies, I swear), I don’t expect there to be any blog disruption this week. Today’s paper doll is a brunette paper doll with long wavy hair. She was designed as a custom paper doll for one of my Patrons, Elizabeth. This year, for my Patrons who support the blog at the 10 dollar amount per month, I decided to offer them the opportunity to request a custom doll and outfit. The first custom paper doll one is debuting today! 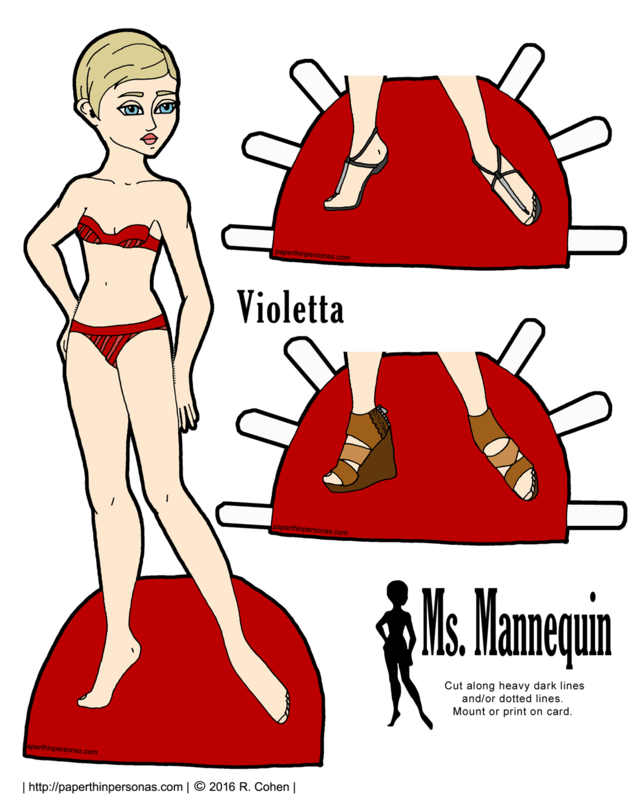 Elizabeth requested a brunette paper doll from the Ms. Mannequin series with brown eyes and fair skin. I named the brunette paper doll Lisette, a French diminutive of Elizabeth. Today’s Ms. Mannequin has the same skin-tone as my other fair skinned Ms. Mannequins- Natalie, Cerise, Violetta. So, she has six more pairs of shoes that she can try out. Tomorrow, she’ll get a dress. Meanwhile, she’s got plenty of clothing options among the Ms. Mannequin clothing choices. I personally have always been a fan of this evening gown, but that’s just me. Want to support the blog? Then think about becoming a Patron. There’s lots of neat perks, like a behind the scenes blog, the Vivian project and, at the 10 dollar a month level, a custom paper doll once a year.